The latest news about the brown marmorated stink bug is that there is no news. What’s a gardener to do then when stink bugs invade? A simple option is to inspect your veggies and fruit and drop any stink bugs you find into a jar of soapy water. 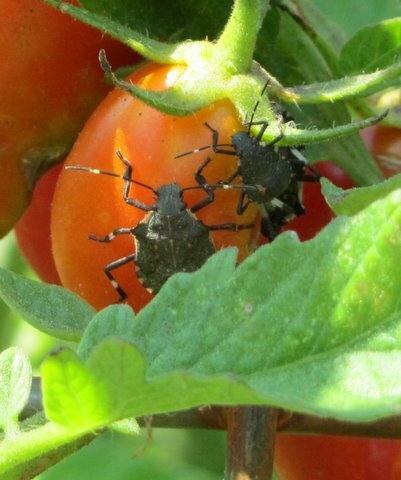 You’ll find another option in the University of Maryland Extension’s Home and Garden Information Center’s fact sheet and its video showing how floating row covers may be used to keep stink bugs off your garden plants. To access the fact sheet, CLICK HERE. To access the video, CLICK HERE. To access the Maryland Agriculture Department’s complete June 22 news release, CLICK HERE. ← Tomato Patch: Lemon or lemonade? Yesterday when picking squash and zucchini, I noticed stink bug eggs all over the leaves of the plants. They were small reddish brown dots in clusters of about 10; each egg was roughly the width of a paper clip. I noticed some adult stink bugs around the base of the plants near the soil line. I scraped off the eggs the best I could with my fingernail. Although they seem to be reproducing, I haven't noticed any damage to any of my plants or vegetables…yet. Those are squash bug eggs. Brown marmorated stink bug eggs are white and laid in a tighter pattern. For me, the easiest way to get rid of the squash bug eggs is tear out the portion of the leaf where they are deposited and grind the eggs with hand or foot. They are rubbery and more difficult to squish than other pest insect eggs. Thanks Jon! I did a Google search on squash bugs and that's what I saw, not stink bugs. Thanks again for the info, that makes two days in a row. The trick with those squash bugs I've learned is to keep up inspection, route out egg clusters first, and foremost. Kill the squash bugs on sight, but remain mindful of the egg clusters. They are much easier to manage before they hatch. Yep, seeing the eggs and a few squash bugs that get squashed if they are caught. They seem to be going after my Big Max pumpkins more than my Seminoles which are right next to each other. When I water I try to water all around the plant because they come up to dry off where they are easier to catch and dispose of. can we not getting rid of the stink bugs without any using a chemical? just as natural? they are so irritating to smell, it can cause me headache.